Didn’t we have a lovely day the day we went to Snape Island? Director: Jim O’Connolly / Writer: Heorge Baxt / Cast: Bryant Haliday, Jill Haworth, Mark Edwards, Jack Watson, Anna Palk, Derek Fowlds, Dennis Price, Anthony Valentine, Gary Hamilton, George Coulouris, Candace Glendenning. This way ahead of its time British chiller bears more than just a passing similarity to the later and greater Hell Night. 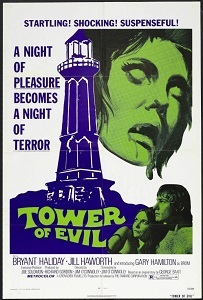 When a hysterical naked young woman stabs a sailor dead on fog-surrounded Snape Island, she is brought back to the mainland with an old relic that is of interest to the academics, who stage a trip there to learn more, while the girl is quizzed about the gory murders of her three American friends. Seven folks take a short vacation there only to have it crashed by a shadowy killer who, it turns out, is the son of the stabbed sailor, driven crazy by the loss of his wife. Very slow moving, which can test your patience, but things kick into gear in the second half and there’s even a formidable final girl sequence. Blurb-of-interest: Jack Watson was in Pete Walker’s Schizo four years later.